Platelet activation is an important part of the pathophysiology of acute coronary syndromes. Inhibition of this by antiplatelet agents forms an important part of the management of this condition. Recently, there has been considerable interest in the variability of platelet response to these drugs and the need to tailor the dose of antiplatelet agents according to the response. Here, we present a patient who had repeated episodes of stent thrombosis and was found to have decreased response to clopidogrel and aspirin (clopidogrel and aspirin resistance) with the use of the Accumetrics VerifyNowTM analyser. We have also reviewed the literature on this subject. Our recommendation is that patients who have recurrent stent thrombosis or thrombotic events on dual antiplatelet agents should have their antiplatelet therapy response checked and have their antiplatelet agents tailored accordingly. Recently, there has been considerable interest in the phenomenon of inter-patient variability of clopidogrel response (sometimes termed ‘clopidogrel resistance’)3 and, to a lesser degree, the variability of aspirin response. This has led to interest in tailoring the dose of clopidogrel per patient according to the responsiveness of the platelets to the drug.4 In this report, we describe a patient who suffered recurrent ischaemic coronary events despite dual antiplatelet therapy, and we discuss the various implications of poor antiplatelet response and the current treatment options for similar patients. A 41-year-old woman first presented to the rapid access chest pain clinic in May 2007 with a history of exertional angina. Her risk factors were hypertension, hypercholesterolaemia, and a positive family history of ischaemic heart disease (IHD). She had given up smoking three months earlier after a 21 pack-year history. She had a high body mass index of 31 kg/m2 and suffered from hypothyroidism. Exercise electrocardiography (ECG) was positive for symptoms and ECG changes in stage 2 of the Bruce protocol. 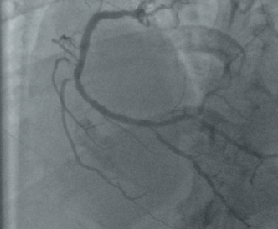 Subsequent elective coronary angiography demonstrated minor diffuse disease in the left coronary system with a severe ostial right coronary artery (RCA) lesion (figure 1). While waiting to undergo elective PCI to her ostial RCA lesion, she was admitted urgently with troponin-positive chest pain and infero-lateral ST-segment shift on an ECG two weeks after her initial presentation. 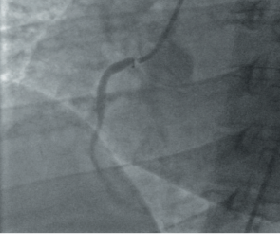 Urgent PCI was performed and a 3 x 16 mm paclitaxel eluting (TaxusTM) stent was placed in the ostium of the RCA. She was discharged on dual antiplatelet therapy. She presented again a month later, to a local district general hospital with an acute infero-lateral ST-elevation myocardial infarction (STEMI) for which she was treated with thrombolysis. There was no resolution of her ST segments or symptoms and she was transferred to our institution for rescue angioplasty. Angiography at this time revealed a patent RCA stent, but with a thrombotic occlusion of a small posterior left ventricular (PLV) branch. It was likely that she had subacute stent thrombosis, and the thrombolysis had largely dissolved the thrombus, but with a small remnant in the distal vessel. The vessel was wired and a balloon used to disrupt the thrombus. A stent was not deployed as the vessel was of small calibre. She was treated for 24 hours with the glycoprotein IIb/IIIa antagonist, tirofiban, and low molecular weight heparin, and her condition stabilised such that she was subsequently discharged on dual antiplatelet therapy. She remained fairly well, until 18 months later, when she presented once again to her local hospital with chest pains. ECG on this occasion again showed an inferior STEMI. She was successfully treated with thrombolysis and was transferred for further assessment. As part of a separate research protocol, platelet function studies were performed using the Accumetrics VerifyNowTM rapid platelet function analyser (RPFA). This showed a raised level of P2Y12 resistance units (PRU) of 363 after 30 days of clopidogrel 75 mg once daily, indicating a poor platelet response to clopidogrel. The same device also demonstrated significant aspirin resistance with aspirin resistance units (ARU) of 630. Repeat angiography now showed new pressure damping in left main stem (LMS) with mild disease only in the left anterior descending (LAD) and circumflex coronary vessels. There was new late ostial in-stent restenosis (amounting to 50% of the luminal caliber), and a tight ostial PLV lesion (figure 2). A pressure wire study to the LMS was performed and this was positive with a fractional flow reserve (FFRmyo) of 0.77 using adenosine via a central venous catheter. Intravascular ultrasound of the RCA stent revealed that it was well sized and well deployed and the degree of in-stent restenosis confirmed. In view of the left main stem lesion and recurrent thrombotic episodes, she was referred for coronary artery bypass graft surgery, and following this is taking aspirin alone. She continues to do well following this intervention. While the gold-standard test of platelet activity, optical platelet aggregometry, has been extensively used to assess the response to clopidogrel and aspirin in research protocols, it is a complex and time-consuming technique, requiring a high degree of expertise. It is unlikely, therefore, to find widespread acceptance as a routine clinical tool. The recent development of simple near-patient platelet function analysers, such as the VerifyNow RPFA, allows rapid and reproducible assessment of platelet response to aspirin and clopidogrel.9 There is also an increasing body of evidence indicating that poor RPFA results might predict clinical outcome, however, as yet, there are no definite guidelines providing a clinical definition of clopidogrel or aspirin resistance. It has been suggested that an aspirin resistance unit (ARU) level >550 indicates clinically important hyporesponsiveness, and this level has been shown to predict post-PCI myonecrosis.10 Two recent papers have identified the clinically relevant cut-off point of clopidogrel resistance to predict subsequent negative clinical events for RPFA PRU as 23511 and 240.12 As the weight of evidence supporting the use of near-patient tests for this purpose increases, interventional cardiologists need to decide whether to apply this technology in their own departments. This case illustrates the importance of antiplatelet resistance and we suggest that all patients with acute or subacute stent thrombosis should have their stent investigated using intravascular ultrasound to exclude a mechanical cause for the thrombosis. If none is found, platelet function testing using a validated method should be undertaken to exclude significant antiplatelet hyporesponsiveness.